Pictures and magazine essay for Inside Himalayas while travelling through Nepal, October ‘17. Magazine Article, Tips for photographing The Annapurna Circuit. Tilicho Lake just after sunrise. 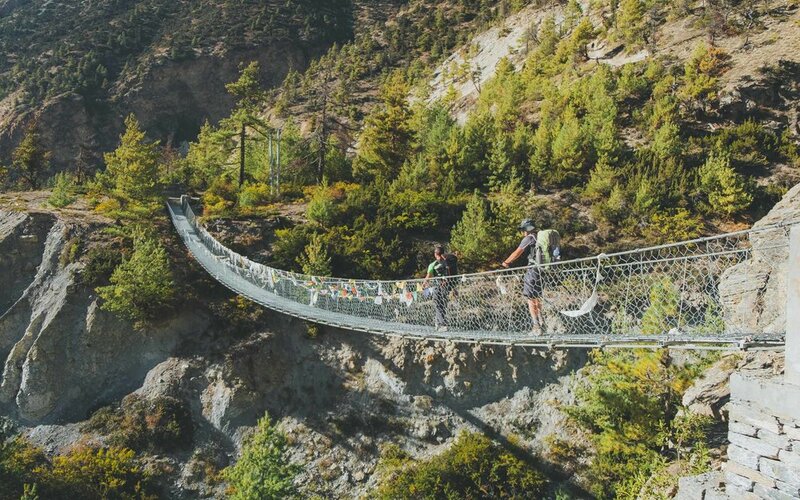 The Annapurna Circuit offers one of the most breathtaking mountain landscapes in the world, meaning that during the trek you will have plenty of chances to capture fantastic moments, unique experiences and beautiful scenery. Some of the following recommendations may look like photography common sense, but I wish I had known them before I trekked the circuit. Does fitness have anything to do with photography opportunities? It does: the trek is tough, and you should be prepared for 6 to 8 hours walking. You’ll need to carry your camera gear, which can be heavy after 4 hours of walking. If you are not used to walking up hills, start training before you trek, and preferably on a regular basis. Getting used to your backpack and boots is very important. As an option, you could hire a porter to carry your clothes backpack, and you just need to carry your camera gear. After a long day trekking, you’ll feel tired. It’s difficult to avoid that, but you can face it differently if you sleep enough and eat properly. Food is essential while trekking, so don’t skip a meal. Manaslu, 8,163 metres, after sunrise. Annapurna II from Chame at Night, full moon on lighting from the left. Everything you carry adds up in your heavy backpack. So I would say versatility takes priority here, unless you’re on a photo workshop or expedition. The basics are: camera body, wide-angle lens (10–24mm) and a telephoto zoom lens (70–200mm). With those, you will be able to cover the majority of the landscapes and people who live high in the mountains. You can choose to carry a third lens, like a 35mm, or instead choose a lense “for everything”, like a 18–135mm. I would say two lenses are enough, as during the trek you’ll not be changing lenses all the time. I carried three Fuji X-mount lenses, the 16mm, 18–55mm, and 55–200mm. To the above, add a tripod for low light and night, and a polarizing filter to improve contrast and make the colors pop. Lastly, keep whatever gear you have protected from the rain, snow and cold, and bring extra batteries too. At the beginning of the trek, from Syange to Dharapani, there are very green landscapes full of waterfalls. Dharapani is where you’ll see the first high mountain of the trek, Manaslu. Although I didn’t overnight here, I think Upper Pisang has the best views of Annapurna II. 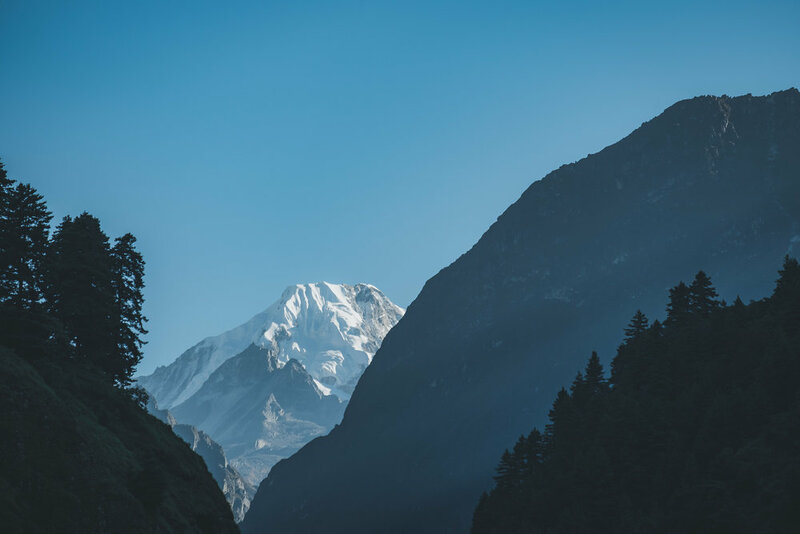 From Ghyaru–which I believe is the nicest village on the trek–you will have an incredible panoramic view of Annapurna II & III. From Manang there are excellent views of the Gangapurna Glacier. Although Tilicho Lake is considered a side trip, it’s an incredible site for photography, especially during ascension and the lake glacier. Wherever you decide to do overnight, look for a place with a rooftop terrace. I found this very important, as it allowed me to be up high enough to avoid obstacles. Sunrise from a rooftop in Manang. This sounds obvious, but it isn’t always followed: wake early for sunrise and stay for sunset if you want to get the best lighting conditions. In my opinion, sunrises were better on the Annapurna Circuit, as every morning their were either few clouds or almost none. Almost every sunset was overcast, which wasn’t good for capturing the light, or getting night shots. It’s important to know the weather conditions, so ask the locals or try to get the forecast. Waking up early can get you better photos. A couple of apps are really helpful for planning when to take photos. Sun Surveyor or PhotoPills will tell you everything about the sun and magic hours, when the moon rises and sets, moon phases, nights where the Milky Way is showing, or when there’s total darkness. Shooting during the harsh light of midday is also worthwhile, but I found that my best pictures were those taken at sunset, sunrise and night. Most of the time I go out with my camera I’m very motivated to take pictures. However, the Himalayas were incredibly challenging to me, both physically and mentally. You can become tired after a long day hiking, or cold, or have trouble with the altitude. These things happened to me, and it became difficult to keep up. My advice is to be alert, flexible and patient. Most importantly of all, always stay positive and have fun!